AIGA and Google’s first annual Design Census 2016, is complete. Our team at Willoughby took the results and compared female to male respondents who reported earning $15,000 or more annually at four levels along their career paths: Junior, Mid-Level, Senior and Leadership. Good news first, the majority of designers at all levels and genders report feeling generally happy. Not bad. We observed that women under the age of 28 are on the move and outnumber men roughly 1.7:1. At age 30 the age gap evens out. There were approximately the same number of females age 30+ as male age 30+ respondents. That said, there are still significantly more men than women in Senior and Leadership positions. Women are not advancing in title or salary at the same pace as men.  The disparity between male and female salaries begins as early as day one entering the workforce.  A noticeable shift occurs, however, when we looked at Senior and Leadership levels where men outnumber and significantly out-earn women.  Only about 26% of reporting designers are parents. Of those parents, 59% are dads and 41% are moms. Of the female respondents, 80% do not have children. While women hold only 39% of the leadership positions and make less money than men, the females report working 2-3 hours less per week than males and they feel equally “good” about the hours they do work (if not a bit better). They also feel equally valued at work and they feel they have the same impact. We observed that the majority of younger, Junior designers of both genders are working 40 hour weeks and report more unhappiness than their older counterparts when their hours go above or below that 40 hour sweet spot. This is counterintuitive to the age-old expectation that you “pay your dues” when you are young. Ironically, the majority of those in leadership positions are working 50 hours or more per week. There was nothing really surprising in this census.  We know women are paid less and there aren’t as many women in leadership roles. We found it interesting, that they report feeling equal to men on so many other factors. So why the gap? Based on our 40-year experience as a woman-owned, woman-centric design firm, we think that women who are mid-level and above are more likely than their male counterparts to negotiate on more terms than just salary. Our female employees have negotiated for an additional week of vacation or more flexible hours instead of a salary increase. They value a positive work environment and supportive colleagues who cover for them when the school nurse calls or mom takes a fall. Benefits such as insurance, retirement and ability to work from home play a role as well. These women know they are making a little less to secure these benefits but they value the balance they gain. We are curious to know if others across the industry are noticing similar trends. We also wonder if we are going to see more of this across both genders as the up-and-coming generation advances. Life experiences have become more valuable than in the past, so will designers seek out companies that share their values or negotiate in ways that allow for travel or even sabbaticals to pursue other interests? We all know that fields such as design have traditionally contributed to reconfiguring the way organizations assemble and retain their workforce. And while there is still work to be done with regards to equity in salary and responsibilities, overall, designers are generally happy and fulfilled, which was gratifying for us. We do believe that times are changing. And who better to embrace that change? Designers.